As for the kitchen… We DEFinitely have plans to send this dated space to melamine heaven, but this will require literally raising the roof. 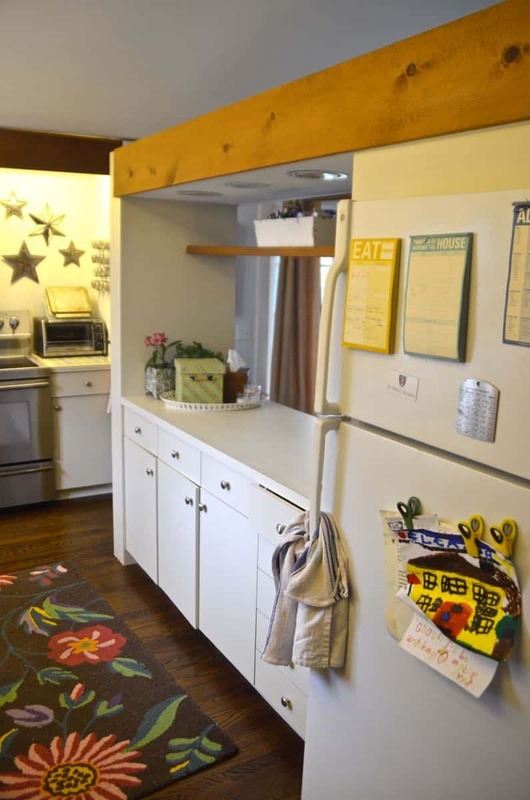 I swapped out the knobs, added a chalkboard and painted… but beyond that, it was just our little bit of the 70s. Until NOW! Booya! 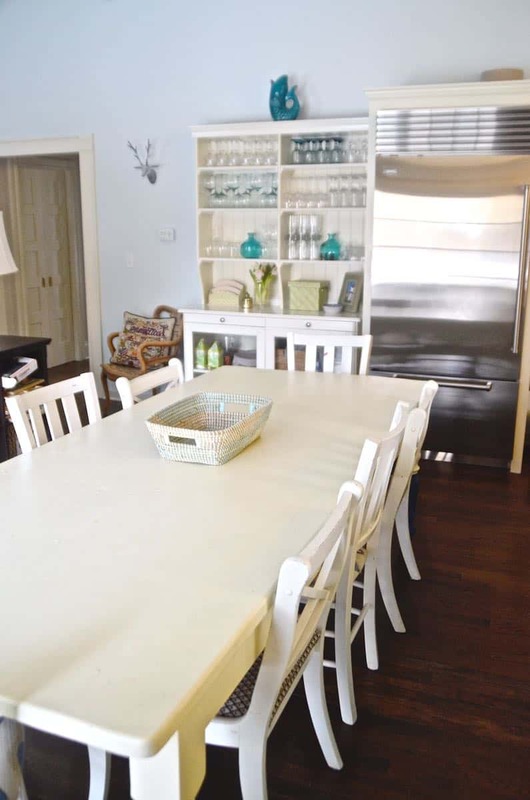 Nope, not a major kitchen demo, but an amazing little transformation that I am THRILLED about. 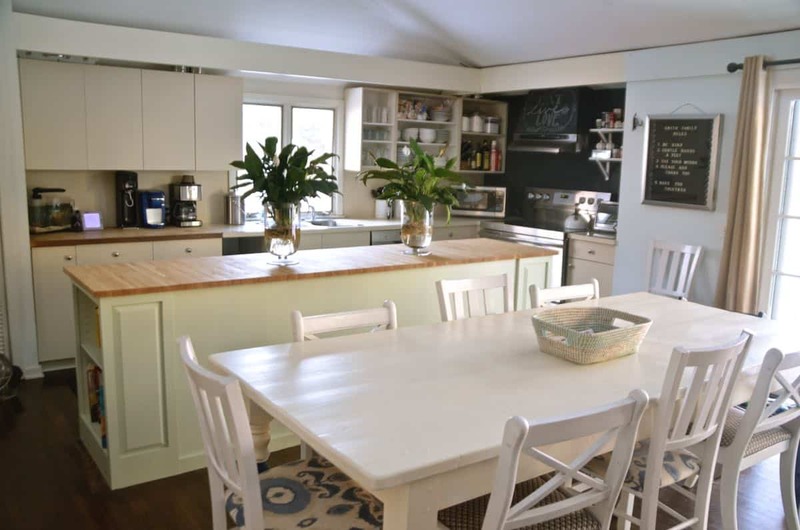 The double-decker kitchen island was the most dated thing about this space in my opinion. 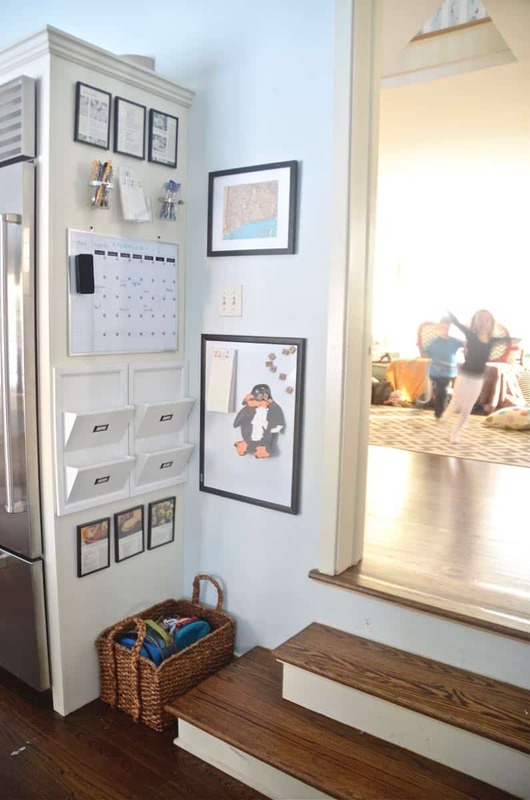 Because the fridge is part of the island (behind the large painting), we couldn’t obviously tear it down… until NOW. I’ll admit to bringing in the experts on this one… not because it’s wildly complicated, per say, but because it would take us WEEKS… and having a kitchen in disarray for weeks ain’t in the cards for this team. And the peace of mind knowing that such a high traffic area is solid and sturdy is probably worth the extra expense. Fast forward a few days and… buh bye 2-story island! Because we had invested so much in a new fridge and spent the money to have our general contractor handle the construction, I was all about cutting financial corners for the cabinets, etc. 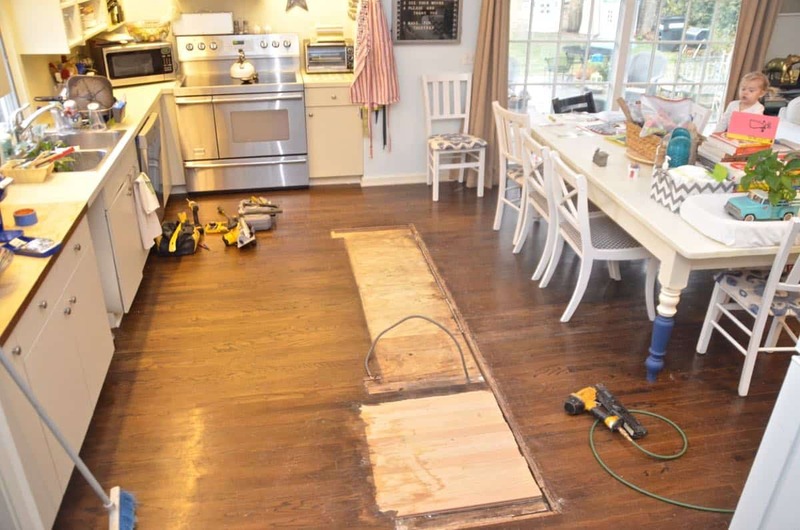 The island was 9 feet long and counter depth wide (24″) and we wanted to keep the same measurements so the wood floor didn’t require any patching. I was SUPER lucky to find a set of 5′ base cabinets at the Restore for $140. 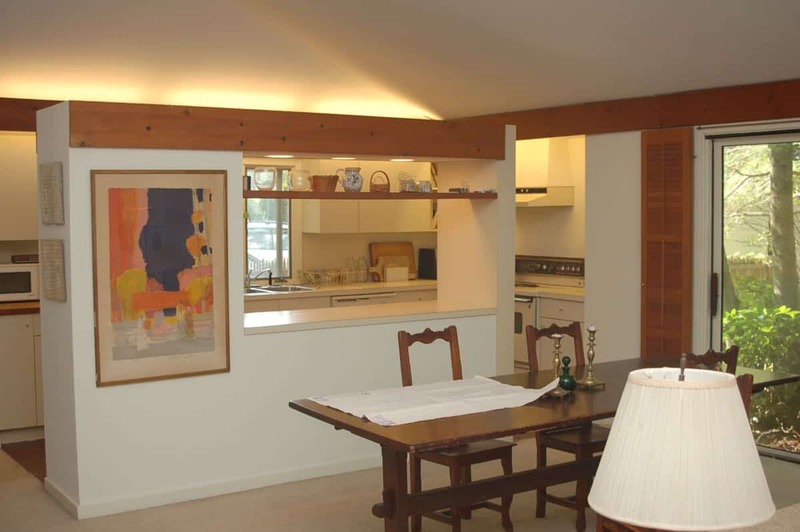 They were solid wood doors, smooth sliding drawers and structurally solid. I consulted a couple of experts on how they paint cabinetry and it’s fussy work… but easy work. 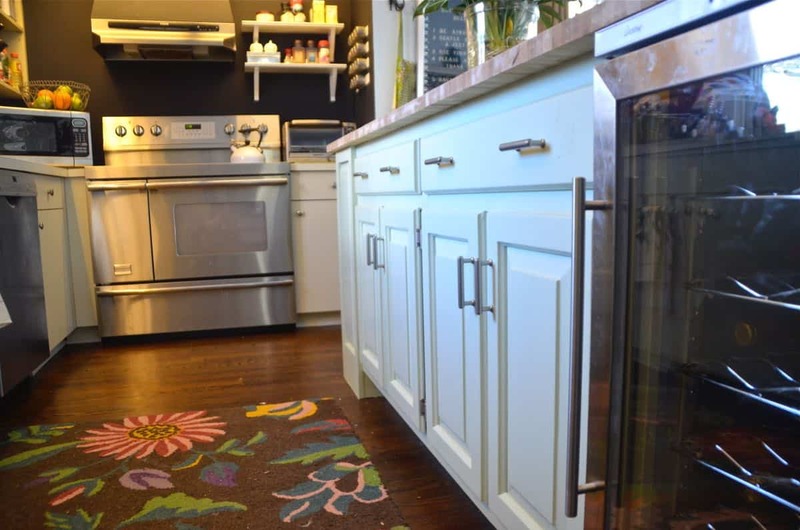 Check out the links above if you want detailed instructions, but here’s the quick and dirty (affiliate links included for your convenience): 1) Remove the doors, drawers, hinges and knobs and gather materials. 2) Use wood filler to patch any holes (especially if you’re replacing hardware that might have different measurements and require you to drill new holes) and sand. I went over my sanded cabinets with some TSP and then a tack cloth to remove any residual grease, grime and dust. 3) Prime. I used Zinsser 1-2-3 which will work on things as shiny as laminate so I figured it would hold up on my wood cabinets. Read the label on your primer for specific instructions, but I gave my cabinets one coat using a brush for the nooks and crannies and then a foam roller for the flatter areas. After 24 hours, I 4) lightly sanded my primer, 5) went over the cabinets again with tack cloth, and gave them 6) two coats of paint. I replaced the hinges and the drawer pulls. I also used some plain white adhesive contact paper to brighten up the inside of the drawers. My Christmas present to Mark was that wine fridge that I found at an estate sale. Wine fridges are a little dicey because they typically come with terrible reviews, but fingers crossed this one will last for us. 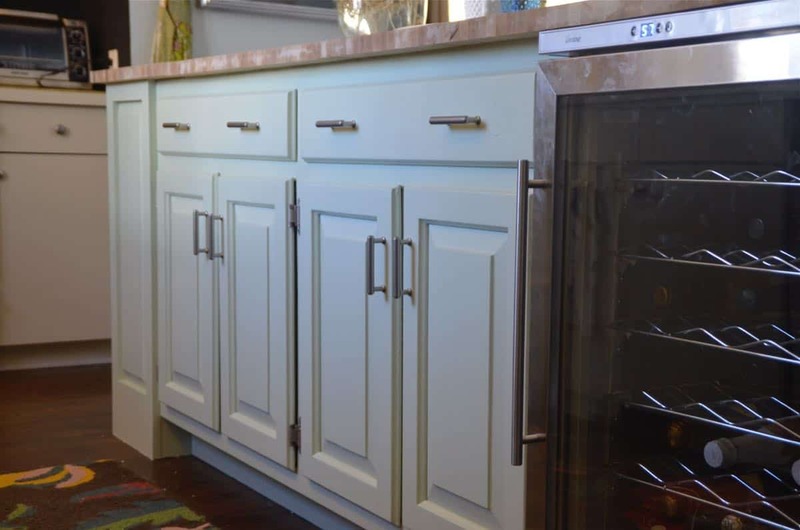 The wine fridge is 2′ wide so with the 5′ base cabinet, we were shy of our 9′ target length by about 2′. 12″ of open shelving on either end was an easy way for our contractor to make up the difference and provide some great storage. I have cookbooks on one side and some matching Homegoods baskets on the other to hold dish towels, baking needs, and cake decorating paraphernalia. Update… this counter has had some user-error glitches. It started splitting in random spots almost immediately which is most likely because we installed it too fast without letting it acclimate, but… I suppose it’s possible that it could just be a thin inexpensive butcher block. I had to go back and patch in places with wood filler. Not the biggest deal since this countertop is somewhat temporary, but probably means I can’t stain it down the line and, well, the principal is irritating. You get what you pay for and I’m glad that this isn’t our permanent kitchen countertop. 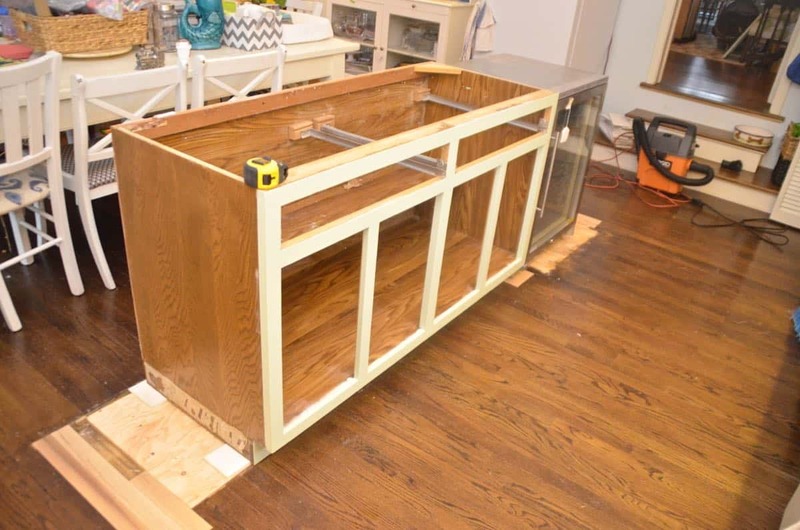 The fridge is a counter depth model intended to be framed and integrated into cabinetry (we were thinking ahead to our final kitchen plans)… until it lands in its final spot, we had to create a frame to cover the mechanicals that aren’t meant to be visible. Not ideal, but not awful either. 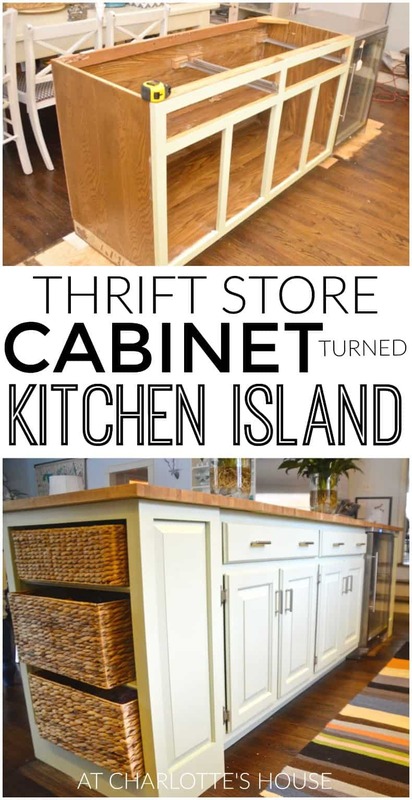 And well worth getting a more updated island and more refrigerator space! I painted this in Benjamin Moore’s Spanish White which is the same off white used on all the trim/ molding in our house (it’s not as yellow as it appears in these pictures…); we didn’t choose this color, incidentally… the previous owner had a love affair with all things off white but we weren’t about to REpaint over all the off white so we’ve kept with the color scheme at least where trim and moldings are concerned. (Update: See what I did with this fridge corner. Now I can see why folks love an open concept! This whole room feels 3x bigger than it used to! Wow! What an upgrade! It makes the room look so much bigger and lighter. And how much do you love all that work space? 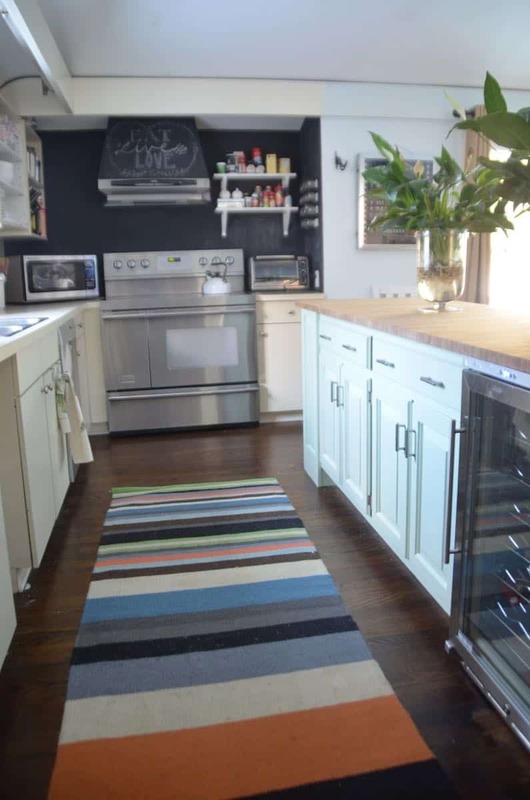 Our kitchen is about 16 feet long but the cabinets and appliances are arranged in a U with upper and lower cabinets going down the middle of the room and a little breakfast area on the other side. I’m dying to knock out those upper cabinets to open it up more. Ah-maze-ing!!! So well done and so impressive. Looks gorgeous, Charlotte! What a difference! I think are secret super hero! 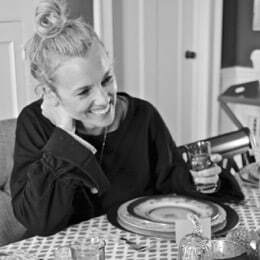 How do you accomplish it all and have 4 happy kids and husband? Your great sense of humor is key. I love reading your directions spiced with your quick jokes. You give my day a most positive boost even though there are many corners of our house that need an upgrade. Great job! I found the same spice jars at Cost Plus a few weeks ago. Really?! I’ll have to look into getting some more! 🙂 Great tip, Leslie. Thanks! Amazing improvement. Looks fantastic. I used Ikea chopping block countertops over my front load washer/dryer and over an open shelf baking area. Both countertops get heavy usage. At first I only used butcher block oil but after two years of removing stains and re oiling,I finally sealed them with a product called WATER LOX. I love love love it. So easy to maintain, food safe, looks fantastic, and super easy to apply. 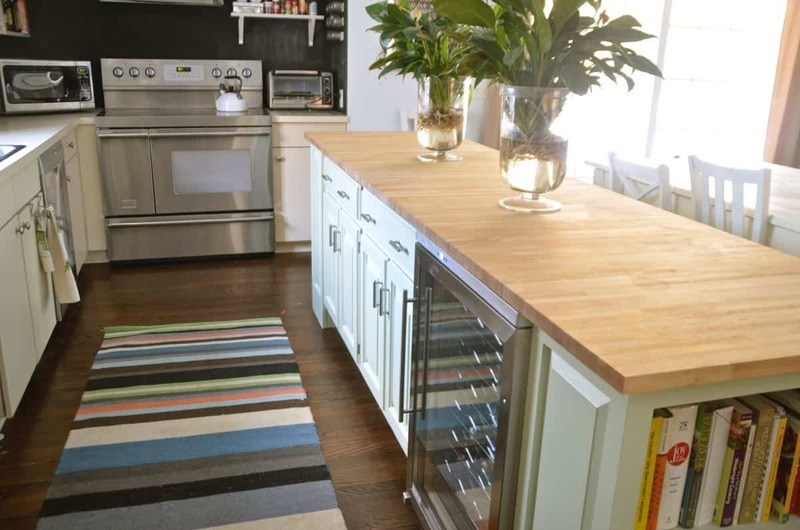 By the way,I also love the Ikea butcher block. I’ve had no problems with it splitting and I live near the coast…and it was so economical. Thanks Megan! Great idea re. the washer/ dryer! Looking into it now. Our butcher block split in a number of places right at the beginning, but I hadn’t let it acclimate at all… probably my fault. I filled in the cracks and haven’t seen any since. Hi Charlotte! 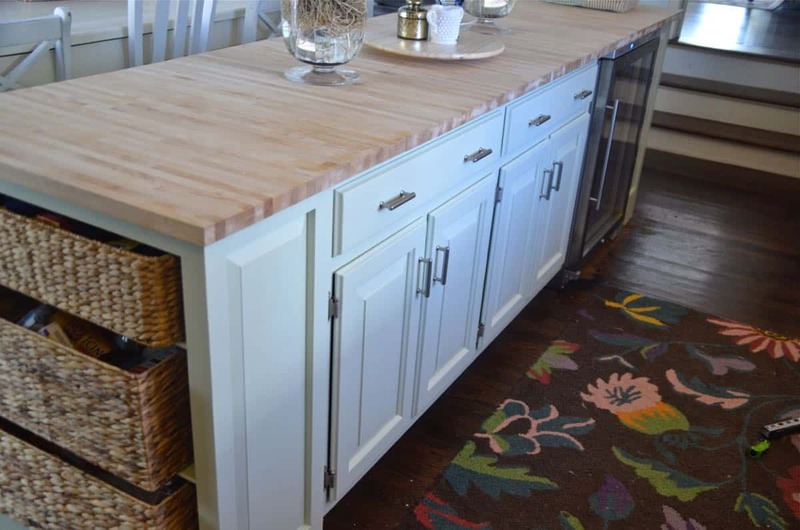 Just stumbled upon your kitchen island through PINTEREST! I am excited because it looks beautiful, and this is pretty much exactly what I am planning for my Kitchen. My question is where you Found the shelves on the ends of the island? I love them, they are the perfect size for what I need! Hi! 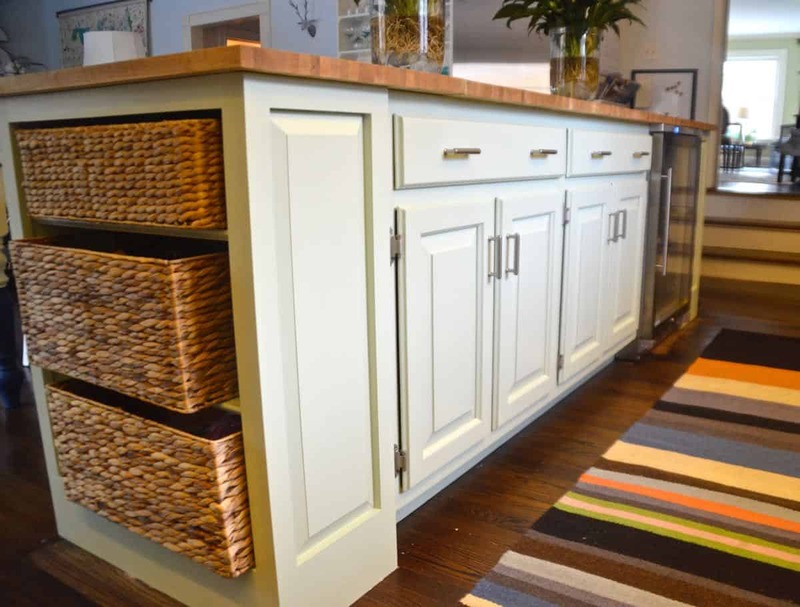 Our contractor built those while he was installing the island, but… they were a super simple build. 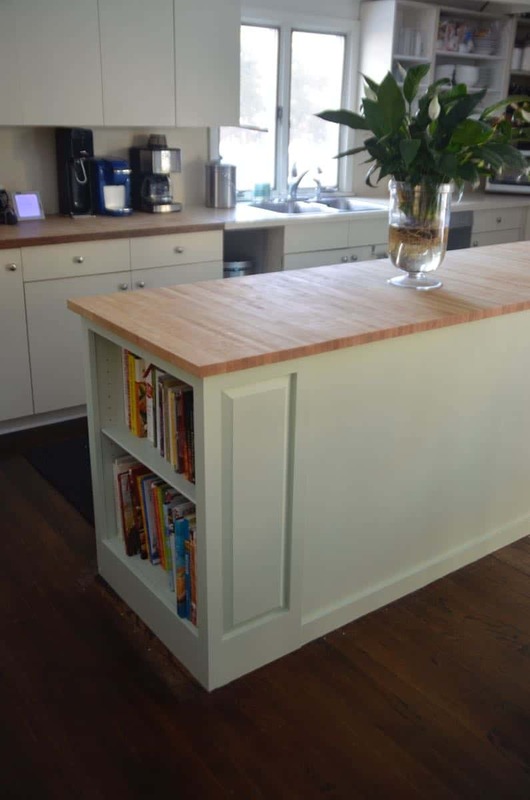 I bet you could do them yourselves to fit the island or have someone make them for you! Our hardwood had a gap in it, so we built those shelves in order to fit the gap, but they were such a fortuitous decision! Hello charlotte!!! You kitchen looks beautiful!! One of a kind!! I have a question about the ikea wood too. 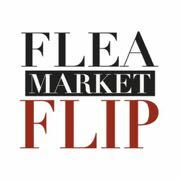 DId You find it On the shelf to buY or did you have to talk to a salesperson and give your measurements of what you wanted? 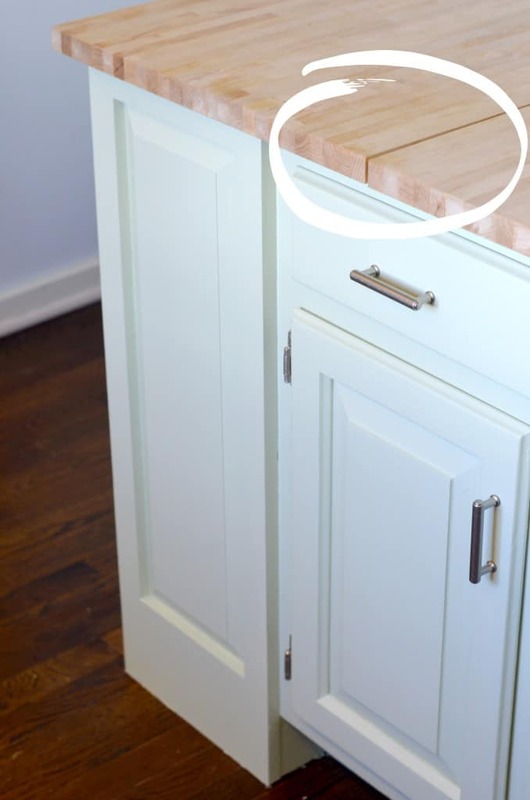 I am Want to buy butcher block to match a kitchen island top that i bought from ikea. Hi! 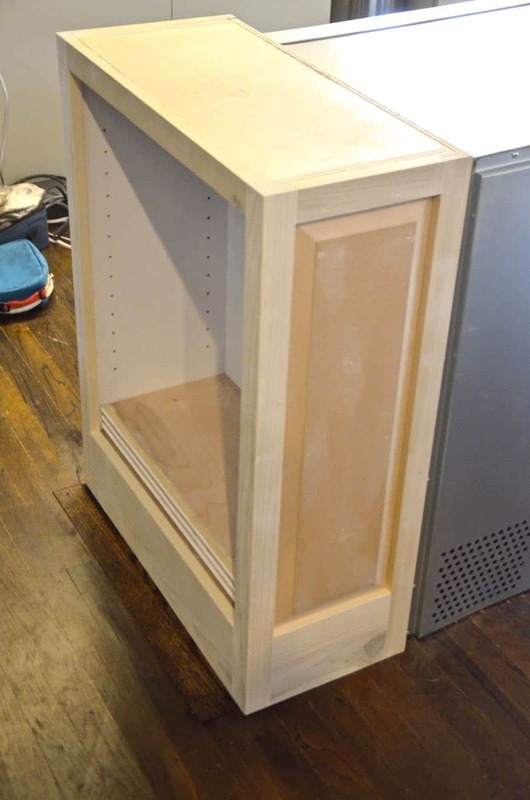 If I recall… we bought the size that best matched our base cabinet and then had to cut it down. Our island was so long and skinny that we had to piece together a couple of pieces of counter top. We should have let it acclimate a little better as there were a few places where the butcher block split at the seams, but I’ve never heard of that happening with others so I think it was our fault for installing too soon.